Aaron DeLong and his wife, Shanda, are the lead and founding pastors of Simple Church, which launched in 2013. 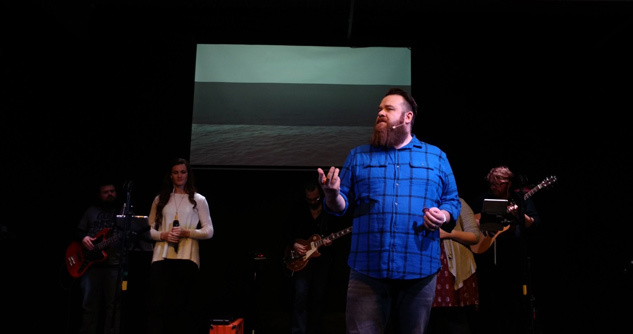 Aaron, who has a business background and is an accomplished performer in the art of sleight-of-hand magic, believes that challenging people to simply be the church, not just go to church on Sunday is his greatest gift. He believes that connecting with Jesus as a true disciple means that you live life on mission. And that mission is to love God, love people, and serve the world. Simple. Last year, Aaron attended the 2018 CMN Conference in Dallas – and he was profoundly impacted by what happened there. See below for his story. At 2018’s CMN Conference, during Scott Wilson’s segment, I was praying in the Spirit and seeking interpretation as Scott was leading us to do. I specifically had on my heart the new building we needed for Simple Church. This had been my focus of prayer since the beginning of the year and I had just come out of a season of 21 days of fasting with this as one of my prayer targets. After praying in the Spirit, the Holy Spirit spoke and said the following regarding my building, “The foundation has already been laid. It is done.” I was bursting inside. Several months followed thereafter, and nothing had changed for us. We still needed a building, but I stood firm and declared what the Holy Spirit had told me. We had been working with another church that God led me to put an offer on, but nothing was coming of that offer. Their board was slow to respond or make any decisions. So, after several months of waiting, the Holy Spirit told me to withdraw my offer - which made no sense, as I felt we were about to get a breakthrough with them. By this point, it’s July 2018. So, on Monday I called to withdraw my offer. On Tuesday, something happened. I got a call from a pastor I hadn’t seen or spoken to in more than a year. He had no idea about our situation. No idea we were looking for a church. He said God put me on their hearts (he and his wife who co-pastor their church) to call me to see if we’d like to hold our church services at their building on Sundays. He also confessed that God had spoken to them months ago to call me, but that they had delayed in doing so, and he apologized for that. Knowing what the Holy Spirit told me at the CMN Conference, I asked when it was that God put me on their heart. They said it was somewhere at the end of February, early March. I rejoiced – and have continued to rejoice – over God’s plans that do not fail. We had our first Sunday service in our new location early December 2018. The auditorium allows for double the seating we had previously and it has a huge, dedicated parking lot for our church. I’m overwhelmed and thankful for what God is doing at Simple Church and I wanted to share this story because of what the Lord spoke to me at the CMN Conference. I hope this encourages you and others who may be considering attending. Learn more about the 2019 CMN Conference by visiting cmnconference.com.